During my time in Cancerland I’ve been blessed to meet and get to know a number of wonderful people. One such person was a lady by the name of Tera Younger. I had the honour to work with her on a couple of projects and also to be part of the same committees and boards. Tera always amazed me at the amount of positions she held, the knowledge that she had obtained and also the tenacity to see a project through. She was an incredibly positive person with a warm heart and a kind smile. There was no doubt that some people referred to her as ‘Terror’ and wished she’d give up on projects affecting them. But Tera didn’t. If she believed in something she would research it, back it with facts and figures and do her very best to improve, alter or advance. For me, Tera was also an incredibly positive person. On more than one occasion she mentored me regarding projects. She put me forward for more senior voluntary roles. She asked my opinion and review. More than that, she believed in me. In my ability and my voice of experience from my own cancer ‘journey’ and also representing others. 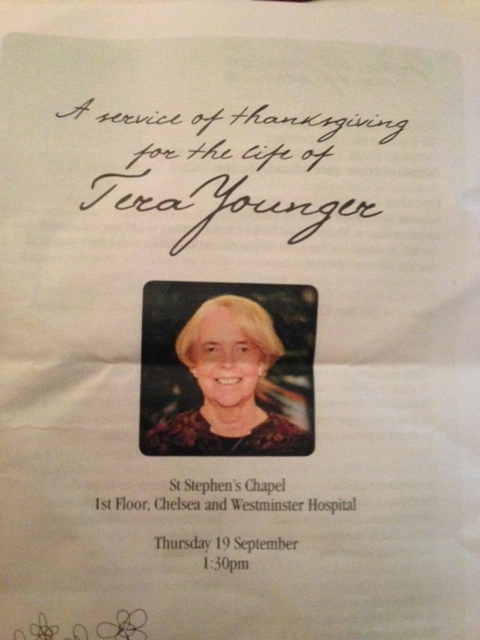 Today a group of us gathered in the Chapel at the Chelsea & Westminster Hospital and celebrated the life of Tera. It was clear from the stories being told, as part of the service as well as before and after it, that Tera will be truly missed. Missed as a person for sure and also for the dedication made to her work. Rest in peace Tera. But also rest assured that your legacy will live on to improve, advance, alter AND importantly make all healthcare more patient-centric. One of the things I don’t often blog about in great detail is our patient-led Facebook group, “Phyllodes Support Group“. You will recall from the beginning of my journey (still don’t like that word but haven’t come up with a better one yet!) that I found myself feeling alone and isolated with a diagnosis of Phyllodes. I remember the fear when I was told that there is no/little information available for patients; no completed clinical trials or reliable data; no ‘specialists’ in the World and a varying degree of myth and misunderstanding on the Internet. Our Facebook group has now been ‘found’ by over 500 members and grows almost every day. We’re from around the World and have differing ‘success’ with medical teams knowing about Phyllodes, the treatment and outcomes. So our group, I believe, has been critical to each and every member. We share experiences, information and resources. We ‘hold each others hands’ at times of anxiety and worry. We have created a database of all the journals and papers ever written about Phyllodes. We run polls of our members to find out the age of diagnosis, the prevalence of benign, borderline or malignant and much more. We also have a poll that asks members where in the World they are from. This poll has allowed us to be more specific with some information and support by sharing local ‘sarcoma protocols’ or similar. There are 4 administrators/moderators of the group. We live in different parts of the US, Italy and me in the United Kingdom. For my part I try to befriend the members from the UK and share with them more local information that may be useful. Today was no different. I’ve been speaking with a new member of the group who was dissatisfied with her local hospital. They had said they knew it was Phyllodes and how they were going to treat it – ‘watch and wait’ – despite it growing rapidly. It was suggested that she get a referral to the Royal Marsden for a second opinion. This morning I met up with her and her husband at the RMH before their appointment. Inevitably there were a heap of questions they both had before their appointment (and ones they’d not wanted to ask in the group). I hope my company was of value and comfort to them both. I know I would have loved to have found just one other person with Phyllodes in the UK that I could speak to when I was diagnosed. Today I woke early and headed out to get the bus into Chelsea. I’d had a somewhat sleepless night anxiously running through all the things I needed to say this morning. As the bus slowly made it’s way down the Kings Road I will still mentally making notes. This time though the notes and things to remember weren’t for my own ‘consultant Q&A session’. I was meeting up with a lady that I’d ‘met online’ a few weeks ago. She posted on a forum a question about Phyllodes and had concerns there was nothing out there nor anyone else diagnosed. Her comment appeared in the many different internet search mechanisms I have set up and we became acquainted. Over the past few weeks we have corresponded by email regularly and I have been able to introduce her to the ‘Phyllodes Support Group’ on Facebook. Like so many of us diagnosed with Phyllodes, we can’t find information or resources easily accessible. If you go on to many cancer sites or into information centres there is never (or very rarely) any mention of it. Just in that moment, it can feel even more frightening and isolating than ever. Today was a consultant appointment that I had encouraged. The lady had many questions and her own hospital didn’t seem to know or understand Phyllodes. Therefore a consultation at the Royal Marsden with sarcoma specialists we hoped would help her get answers. The lady had been up tremendously early to make the journey to London and we met (with her adult daughter) in a coffee shop around the corner. Because of delayed trains we only had about 30 minutes. But enough time to walk and talk on our way to the hospital, run through the questions she’d got written down and importantly, I believe, enough time for her to meet me and know that we do survive Phyllodes! I left them at the hospital as they were called in for the appointment, we hugged and I wished them luck. The lady then handed me a card. The sun was shining so I decided that, for once, I really did have enough time to walk home and set off along the Fulham Road and to the river pathway. 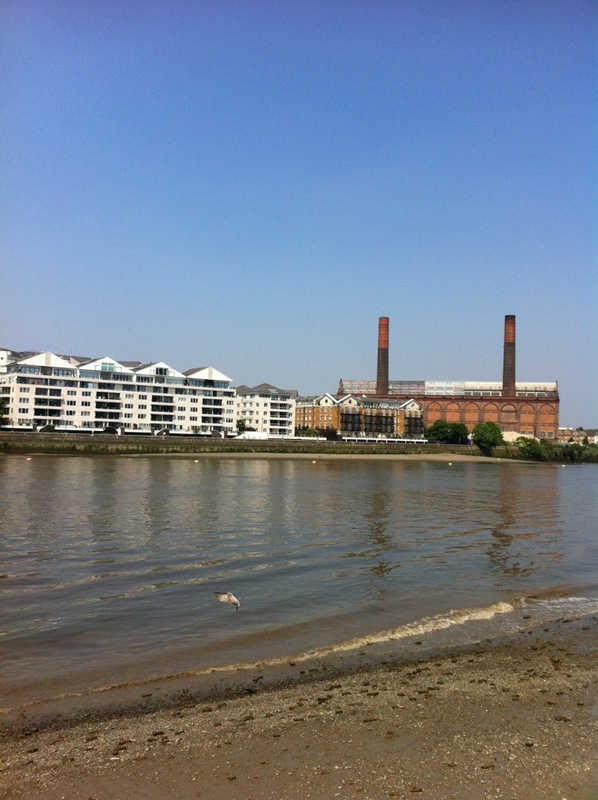 Just past Battersea I found a bench sheltered from the now very hot sunshine and stopped for a minute. My phone blipped with a text from the lady letting me know they’d just left the hospital and would email fully later. I, of course, (and you’d expect nothing less) suggested that she and her daughter enjoy the sunshine somewhere fabulous for lunch with a glass of bubbles… !!! “They say that ‘Elephants never forget’… well neither will I Anna! I will never forget all the support you have given me this last month – giving me links and pointing me in the right direction. There might have been a tear that snuck out and rolled down my cheek… or it could have just been the sun getting in my eyes! I walked home wondering what it would have been like had there been a ‘Me’ around when I was diagnosed. In March of 2010 I registered with an organisation, Imerman Angels, as a Mentor Angel. I met Jonny Imerman first at the YSC conference in Atlanta and was totally bowled over by his zest for life, enthusiasm and passion that no-one should ever be alone following a cancer diagnosis nor feel like they’re the only one with that cancer or at that age. Jonny set up Imerman Angels (www.imermanangels.org) in 2003, an organisation that introduces each cancer fighter to one survivor (“mentor angel”) of the same age, same gender, and someone who has already beaten that particular type of cancer. That cancer survivor would be an angel – walking, talking, living proof to inspire the fighter that he/she can beat cancer. As you all know from this website, I spent many many hours seeking others who were diagnosed with Phyllodes and also hoped that they would be the people who were now my walking, talking, living proof that I could beat Phyllodes. So, when I met Jonny, and felt able, I signed up to be a Mentor Angel. Yesterday, I received an email saying that they’d been contacted by someone newly diagnosed and could I mentor them. I can’t tell you how privileged I felt to receive that email and be a part of someone else’s positive journey to wellness. Today, we’ve exchanged a number of emails and despite living in different continents, I was able to signpost her to our Facebook ‘Phyllodes Support Group’ and also a few members who lived nearby but mostly to listen, to answer questions and to hold her hand. She, like me a few years ago, said that just knowing there was someone else out there who was further ahead in her journey and understood.